As the founder of qloud, i’ve been immersed in Web 2.0 for the past 12 months (at least) and as a man i love Chuck Norris. Like Chuck, i never sleep, i wait. While i was waiting, i found this list of Chuck’s activity in web 2.0 world. Read on…. Chuck Norris was refused an investment by a VC. Once. Chuck Norris read the entire blogosphere. Including splogs. 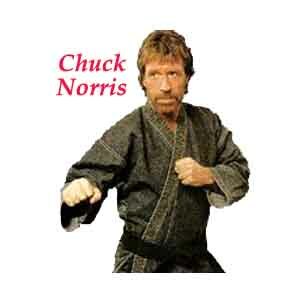 Chuck Norris invented blogging in 1974 in order to keep track of people he roundhouse kicked to the face. Flickr gave Chuck Norris a funny look. Now you know why it needs a massage. Chuck Norris doesn’t search Google. He just stares at the screen until Google pops the website he needs. Chuck Norris does not build to flip. He builds to roundhouse kick to the face. Chuck Norris has more friends on MySpace than Tom. Chuck Norris did not get acquired by Yahoo. He traveled back in time to 1849 and started Yahoo! himself. Now you know how the gold-rush started. Chuck Norris showers with AJAX but no water. Chuck Norris does not use a web server. His beard serves HTTP. Chuck Norris does not use tagging to remember websites. He roundhouse kicks them to the face then they remember him. Chuck Norris doesn’t validate. All standards are required to conform to his content. Chuck Norris has an open API. His right leg, coming straight at your face. If you’ve been spending too much time on Slashdot, this is for you. Google Apps Launches. What Now?